In a recent hints blog, I described how to play Flash games in Dashboard. This trick uses Safari’s Web Clip feature to create a Dashboard widget showing just the Flash game. Although Safari isn’t my favorite browser, I think its Web Clip feature is an amazingly useful and powerful tool, as demonstrated by the previous Flash games hint. Another practical use for Web Clip is to create a streaming video Dashboard widget. As it turns out, there’s some pretty compelling streaming video on the web this week, in the form of the Shuttle’s Hubble telescope servicing mission. Live video of the mission is available (globally, I believe) on the NASA TV web site. This mission first requires capturing the 23,000-pound Hubble space telescope, and then performing a series of five space walks to to repair and replace various parts of the telescope. This is a complicated mission, and all of it can be watched in real-time (most of the time) in full color with audio…while it happens at 22,000 miles per hour, 350-or-so miles above the Earth. But loading the page each time you want to watch a bit of the mission is a pain. Safari’s Web Clip, though, turns the NASA TV feed into my own personal space TV station—with one added twist that makes it even more useful. Launch Safari, load the NASA TV site, and then click the Web Clip button on the toolbar, or select File -> Open in Dashboard from the menus. 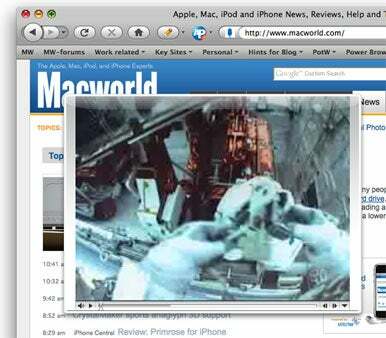 Safari will then dim the page and show a highlighted area; move the mouse around until it’s over the video clip portion of the page and click the mouse to select that region. Click Add, and Safari will open the selected region in Dashboard. Once you’ve created the web clip, you can quit Safari if you wish—it doesn’t need to be running any more. At this point, you could be done—just click the play button in the widget, and the video (complete with audio) will start playing. However, there’s one problem: each time you close the Dashboard, the audio and video stop streaming (and obviously, the video isn’t visible any more). Leaving Dashboard open all the time isn’t an option, either, as you won’t be able to actually use your Mac while watching the video. What do you get with developer mode? I’m not sure about other features, but the main feature (as described in the Tiger Dashboard piece) is that you can now drag any widget out of the Dashboard and onto (technically, above) your Desktop, and it will continue working—even when you then close Dashboard again. Open Dashboard (F12), and start dragging the NASA TV widget you just created. While still dragging, press F12 again to close Dashboard, and you’ll see that the widget is still being dragged. You can then drop it wherever you like, as seen in the image at right. Now you can leave the streaming video widget open for as long as you like while working—pause and restart it at will, and it will always be there, ready to go. As good as this is, it’s not quite perfect, because dragged Dashboard widgets live in a layer that’s above everything else on your screen, obscuring anything beneath. There’s no sending this widget to the background, either, and the Hide Others command won’t have any effect on it. Still, if you’ve got the screen real estate for it, this combination of Safari, Web Clip, Dashboard’s developer mode, and an interesting video source can help you create a personal video channel for anything you’d like to keep an eye on as you work.